Winter is on its way out and spring is finally upon us. Time to put away the seasonal clothing, turn down the thermostat and most important of all, get the house ready for the new season. That means decluttering. One of the most important parts of decluttering, that really goes a long way to making it feel like you have optimized and economized on space, is proper document storage. 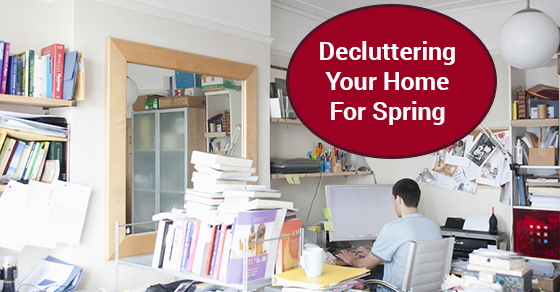 If you are ready to declutter your home for spring and are looking for some great document storage tips, here are some to help get you started. The living room should be high on the list of rooms to put in order because it’s where your family probably spends the bulk of their time together. Go through your shelves and look for books, DVDs, manuals and anything else that can and should be safely tucked away to make room for the things that really matter. Cooking and using the kitchen, especially when cooking for friends and family, can be truly delightful, but a kitchen full of clutter can take away some of the pleasure. One of the things that tends to clutter up kitchens, and that people simply overlook, is documents. This is especially true if the kitchen has a desk area that doubles as a homework station or place to store financial records. Go through drawers and gather the documents that you need, place them in labelled file folders, then into labelled boxes and, if there isn’t enough room in your home to store them, consider a self storage unit. The home office can be hard to work from at the best of times, what with all the distractions around, but even more so when there is an accumulation of documents lying around and cluttering up the place. If you are someone who works from home, consider investing in a high quality filing cabinet (perhaps even one that is fireproof), or think about taking some of those old invoices, receipts, important contracts and legal documents, and looking at outside document storage options, like a self storage unit. Bathrooms are one of those rooms that become more cluttered the more people you have using them. The shower, if left neglected, can quickly become a graveyard for empty shampoo and conditioner bottles, and the linen closet can become filled with towels that are virtually destroyed and never used, but remain there, taking up space. Spring cleaning after a long, lethargic winter is not something that people generally look forward to, but the feeling of accomplishment once it has been checked off your ‘to do’ list is undeniable. Tackle spring cleaning and decluttering this year room by room and find space in your home for the things that you really need and that matter most.